The KX-TES824 Advanced Hybrid Systems are phone systems which can support your business and personal needs. The KX-TES824 supports 3 outside (CO) lines and 8 extensions. With optional cards, you can easily expand your system capacity up to 8 outside (CO) lines and 24 extensions* as your needs grow. Both systems provide the features that satisfy the demands of the most sophisticated and cost conscious users. You can connect a variety of communication devices, such as cordless phones, answering machines, computer modems, credit card verifiers, fax machines, and any other device that works with conventional telephone lines. 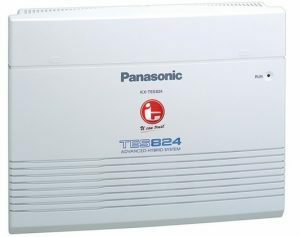 The Panasonic KX-TES824 is ideal for a small business or home office requiring a flexible system with a high degree of sophistication. * 8 of the extensions are ports used for Single Line Telephones.